Create the filling by mixing the minced (ground) lamb, spice and seasoning. Make the pastry by sifting the flour and salt into a warm bowl. Make a well in the centre of the flour. Melt the lard in a scant measure of water and, when it is bubbling, add to the flour and mix thoroughly. Take a small amount (remember the mixture should make 8/10 pies, with their tops) and form into a ball and keep the rest warm while making each pastry case. This is done by rolling a suitable amount for each pie and shaping the crust round the base of a glass or jar approximately 3-3½ inches (7.5-8.5cm) in diameter. Make sure there are no cracks in the pastry - you can trim round the top of the case to make it even. As the pastry cools and gets cool, remove the glass and continue until you have about a quarter of the pastry left to make the lids. Fill the cases with the meat and add the gravy to make the meat moist. Roll the remaining pastry and use the glass to cut the lids. Wet the edges of the lids, place over the meat and press down lightly over the filling. Pinch the edges and trim. Cut a small hole or vent in the centre of the lid (to allow the steam to escape). Glaze with milk and bake for about 45 minutes at 275F/140C/Gas mark 1. 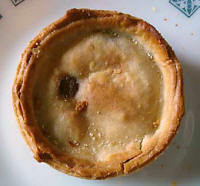 If the pies are not eaten immediately, they can be stored in the 'fridge but always ensure they are properly reheated before being eaten.